This review will take a look at the features of the Stanley TR250 SharpShooter stapler, who would benefit from using it, and the pros and cons of trying it. You’ll also get an in-depth look at its specifications, giving you an insight into how it operates. How often it jams, how many staplers it holds, what materials it works with, and other answers are all in here. With this information, you should have no difficulty deciding if this stapler is right for you or not. 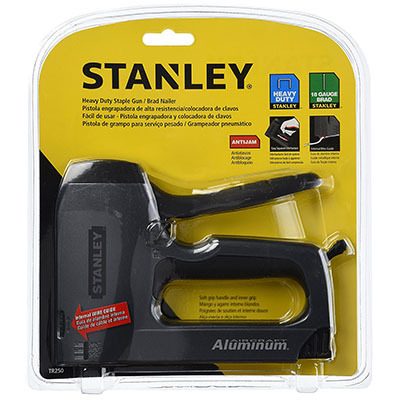 The Stanley TR250 is a manual stapler that requires squeezing the handle to power staples where you want them to go. It is an inexpensive item that provides carpenters and others with an easy-to-use tool that requires very little maintenance. If you can add staples to the drawer, you should have an easy time managing this tool. Let’s see how capable this model truly is! The Stanley TR250 is designed as a general tool with several different functions. For example, it can be used strictly as a staple gun or as a brad nailer for construction or upholstery work. However, it can also be used as a cable and wire tacker to create a variety of different design elements in your home. Its aluminum exterior is designed to be inexpensive but strong and includes a drive channel to improve staple penetration. Using this stapler is very easy, though there aren’t many bells and whistles to its design. For example, opening the staple drawer requires pressing one button. Loading then consists of carefully pressing up to 100 staples inside of the magazine. Slam it shut, and your gun is ready to go. Though there aren’t many power options available on the gun, the easy-to-use design and streamlined operation technique make this a stapler that both amateurs and professionals will enjoy. The specifications of a good stapler should indicate how it is used, what kind of staples it is compatible with it, and a variety of other essential information about its operation. This vital body of knowledge on the Stanley TR250 lets potential buyers like you know what to expect when investing in one of these useful tools. The following specifications are the most important to consider when buying one of these staplers. Read them through to make sure that this stapler meets your needs as a buyer before making a purchase. For example, if you have a hard time using a manual stapler, this might not be the ideal model for you. Before buying the Stanley TR250, it is important to know more about its pros and its cons. While we think it’s definitely a worthwhile tool, there are a few drawbacks that knock it down a few pegs. Thankfully, the positives do outweigh the negatives here. Therefore, take a look at these two lists to get an idea of what kind of tool this is and whether or not the TR250 is your best choice for a hand stapler. Occasionally, it fires blanks or fails to fire off a staple. Contains a pinch point that requires adjusting your hand position. Lacks the power some users wanted. Struggles in certain types of plywood. Thankfully, the reviewers were also quite positive about other aspects of this tool. For example, most were very pleased with the price and the accuracy of the tool. Others were thrilled with the aluminum build, as it resisted rust very well. In fact, a majority of users reported no serious problems with the stapler and found that it was a good deal for the price they had paid. When it comes right down to it, we think that the Stanley TR250 is a simple, but effective, hand stapler. It might not be one of the most exciting choices on the market, but it’s a great deal for the price. In fact, it’s the kind of side or belt tool that the average carpenter should have on at all times. If you have any experience with this stapler or others like it, please don’t hesitate to contact us and let us know more about what you think.